Sea Cursed, by USA Today bestselling author, Amy Lee Burgess, is the thirteenth novel in the Othala Witch Collection, a series of dystopian paranormal romances. For centuries the mark of Othala has been a death sentence for every witch who bears it. They call these witches sea cursed. Their destiny is to save Galveteen from monsters known as ravagers by casting the spell of Reutterance, which, legend has it, kills them. The non-magical Trumbull family has ruled Galveteen ever since the bloody coup where they overthrew the witch co-regents, changing the balance between witches and non-magicals. Where once witches were revered, now they are reviled. Until she is marked by Othala, Demetria has no idea she is a witch. Brought up in a non-magical neighborhood of Seawall North, she’s been taught to regard witches as inferior beings. Now she must face the fact that not only is she something she’s always despised, but sea cursed as well. As the most powerful earth witch on the island, she must somehow learn to control her unfamiliar, powerful magic. Logan grew up embracing his sea witch heritage in a neighborhood of Seawall South. He is proud to bear the mark of Othala, even when he is derided and sneered at by the Lord Regent’s elite guard and the Regent himself. Brash and rebellious, Logan walks a dangerous line when dealing with the formidable Lord Regent – one that could cost him dearly. Sparks fly when Logan and Demetria meet. Neither has bargained on love being part of their destiny to save their world. Together they must battle prejudice as well as ravagers in a race to save Galveteen from destruction. OMG; this author not only constructed an entire world, but developed very real characters. I was mesmerized with this entire book. The love that grew for Dem and Logan was beautiful and fun. The love they had for their families and friends was extraordinary in every way and what they went through to protect them and the entire population of their island home was fantastic. I wanted to help them kill the ravagers (sp?) but only after the horrible regent was killed. This is the first book in this series that I've read and I'm looking forward to reading the rest of the stories in this series. I definitely recommend this book. Enjoy! I wasn't sure what to expect when I started reading this story of the Othala witches. I have to confess this story delighted and enchanted me from the beginning. Burgess did an incredible job transporting me to a world where two powerful witches must band together to save their island from marauding ravagers. I love how Demetria began her adventure with no clue she had magical powers. Suspense and intrigue grabbed me from the first page and didn't release its grip until I reached the end. I would highly recommend this book to everyone. A new read from Amy! I love her characters. I think the development and complexity she is able to convey in such a short word count allows me to care about each story she writes. In Sea Cursed, she works with witches, but these witches are not your ordinary teen angst demon conjurers! There's a reason for their witchery - they have a very important mission they must fulfill for the survival of all they love, including each other. Definitely a fun, exciting, and intriguing read that makes me want to learn more about the world in which these witches witch. across genres. 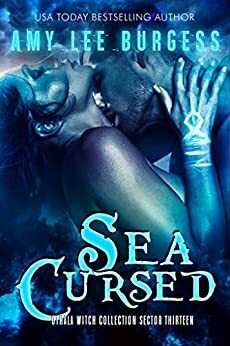 Like the rest of her books, give yourself a treat and get Sea Cursed. I can't wait for her next book, whatever that may be! 5.0 out of 5 starsI found a new author and what an amazing book! This is totally out of my genre but I heard from word of mouth about this author and her book. I'm a romance junkie and this book opened my eyes to a genre I've overlooked. The characters, the setting descriptions, and the story are beyond anything I could have imagined. I will follow this author and look for more books in this genre.